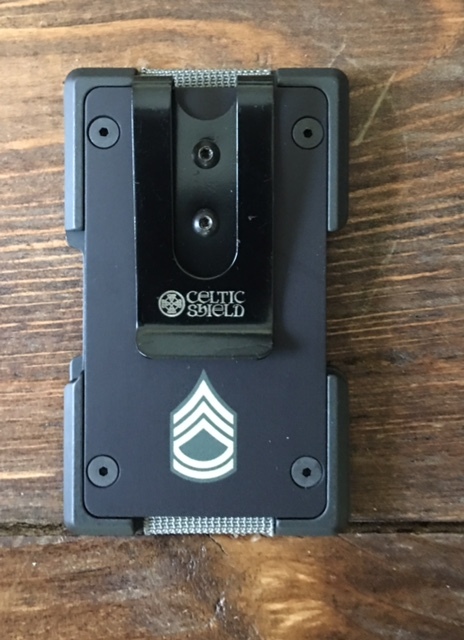 Each wallet is machined with 60/61 military spec. aluminum. Is there an extra charge if I want more than one plate engraved with my initial purchase? Currently Celtic Shield requires an upcharge for any image, large or small, to be placed on your slick or clip plate. You can see these images and prices in our online store. What kind of images can I put on my wallet? Just about any image or text can be placed on your selected wallet. Check out our image gallery, small and large, engraving for ideas on what to put on your wallet. Can I have color engraving? Currently Celtic Shield does not have the resources to offer custom color etching or engraving. Can I order in bulk for my entire unit/section/squad or division? Celtic Shield would be happy to provide items in bulk quantity and will provide significant cost savings when your order in large quantities. Since this solution is a special order please drop us an email via the contact us page and we will contact you within 24hrs to discuss your special order. The basic wallet without engraving will usually ship within 3-5 days from the time you place your order. Any order that requires custom engraving, big or small, can take up to three weeks to arrive. Shipping and handling is automatically assigned to your order at checkout and currently consist of a flat rate of $6.00 anywhere in the continental United States. Outside of the United States to countries like Belgium and Germany a flat rate of $26.00 (excluding APOs) is assigned.